Vancouver, BC, September 8, 2011 – Langara College has signed a Memorandum of Understanding (MOU) with INSCOL Academy, one of India’s leading healthcare service providers, to offer the first-ever Post Graduate Certificate in Nursing Leadership and Management for International Nurses in Western Canada. 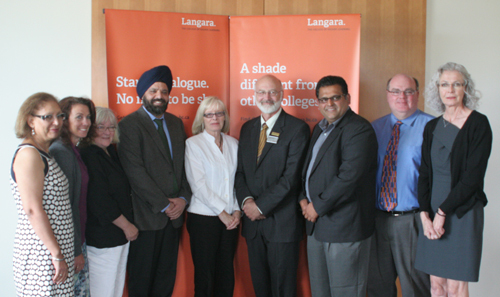 A signing ceremony was held on August 30th to celebrate Langara's new international partnership. Students from India who enroll in the new certificate program and successfully complete the credential will develop their leadership and managerial skills, allowing them to advance their careers when they return to India. They will also benefit from exposure to the rich, expert knowledge of Langara’s nursing faculty. For Langara students, the program represents a unique opportunity to engage with an international community of nursing students and gain perspective on global healthcare issues and experiences. The additional funding created through the new program will also enable Langara to purchase equipment and increase classroom capacity. At the institutional level, the partnership agreement provides a successful model for Langara to augment and grow its credential offerings and enhance its reputation in Canada and abroad. Established in 2003, INSCOL Academy is the education division of INSCOL Hospital, one of the leading healthcare service providers in Chandigarh, India. The Academy offers exclusive opportunities to Indian nurses to become global nurses and enhances their knowledge, skills and professional conduct as well as their exposure to best international nursing practices. INSCOL has partnership agreements with five Canadian institutions, including Langara College, as well as 11 other institutions within the United States, Australia, and New Zealand.